There's no doubt that something needs to be done with that side of the tracks, but why can't it be as simple as landscaping an events/recreational park on the site? This has worked for Birrarung Marr in Melbourne on a similar slice of land. Better yet, follow the ACC's vision for the site and build the park over the train tracks. Just because a site is in disrepair doesn't mean it needs to automatically become a commercial property of sorts. I'd agree in principle, but this site is located immediately far and away from anything that would support the above. Worth a shot though. "events/recreational park" - perhaps there's a demand for a skate park in the vicinity? They also need to improve connections to the river. How about a bridge across the rail lines from the hospital? There was supposed to be a kids play area as part of the Festival Centre redevelopment, in front of where the amphitheatre was, but I'm not sure if it's still on the cards or not. It's right next to the train station (you could even incorporate a new western entrance as part of it), is next to the tram line, across the lake from Adelaide Oval, next to the hospital and UniSA City West and only a short walk from Bonython Park. I can't imagine a better located site in the city for a recreation park. Davis Cup Tennis is coming back to Memorial Drive. Great news for Adelaide! Adelaide needs a redeveloped multipurpose sports stadium on Memorial Drive to avoid falling further behind other capital cities, according to South Australia’s greatest tennis player. Davis Cup captain and former world No. 1 Lleyton Hewitt says an upgrade of the precinct is overdue and can help propel the city, and state, back on to the world tennis stage. Hewitt said Adelaide must act quickly to take advantage of changes in professional tennis with the new ATP World Team Cup to be held in Australia from January 2020. “Everything is moving so if you came out and said ‘Yep, we are going to get it across the line, we are going to build a brand new centre’ you can put your hand up and start fighting for an event. That’s what I would like to see here,” Hewitt told the Sunday Mail. Adelaide lacks a world-class tennis tournament to compete against other capital cities, including Brisbane, which took over the Australian Hard Court Championships in 2009. “If South Australia stands up and actually takes it on and wants to do something and shows that they are proactive then that’s where you can say ‘OK, maybe we can get a tournament back’,” Hewitt said. “One of the saddest things for me was when the Adelaide tournament moved to Brisbane and that’s where it all started for me, growing up watching it as a kid. I saw all the greats come and play and then for that to go. “Have a look at the centre of Brisbane compared to Memorial Drive now, you can’t compare the two, so you see why it went there. … and what it could look like. The Advertiser last week revealed Adelaide would miss out if Australia successfully bid to host the 2023 FIFA Women’s World Cup because there was not a suitable stadium available. “I love Memorial Drive but whether it’s a multipurpose retractable roof, whatever it may be, something basketball, netball, everything can play in, it would be great for the city,” he said. Hewitt said an initial $10 million upgrade — creating 37 courts across four different surfaces — of the Tennis SA and adjacent Next Generation tennis facilities over the past year was commendable but more needed to be done. “It’s fine they have done a part of a redevelopment but still that’s not the main thing, that’s not the thing that’s needed — the thing that’s needed is the centre court, the stadium,” he said. The Memorial Drive facilities — adjacent to Next Generation fitness club — are leased from the Adelaide City Council in a piecemeal ownership deal that has 30 years to run. Tennis courts were opened on Memorial Drive in 1921 and the existing northern grandstand was built in 1938. It was once a regular Davis Cup venue but last hosted a final 50 years ago. It is understood the Federal Government funded $10 million was critical in helping Adelaide secure its first Davis Cup tie in 15 years when Australia plays Bosnia and Herzegovina on February 1 and 2 next year. The Advertiser in January revealed a 6000-seat, canopy-covered stadium, hosting basketball, netball, concerts and other events, was proposed as part of a $150 million redevelopment of Memorial Drive. Federal Liberal MP John Alexander — the youngest player to represent Australia at the Davis Cup and a founder of the Next Generation fitness club in Adelaide 20 years ago — said a new sports facility needed to be multipurpose. “Melbourne has a sports precinct, tennis courts and soccer pitch. You have to activate so it is used more like Rod Laver Arena. A lot of people in Melbourne think it’s a concert hall,” Mr Alexander said. Treasurer Rob Lucas said the State Government was prioritising investment in health, education and child protection. “Significant taxpayer-funded expenditure on large-scale sporting upgrades or new stadiums will be considered with all other funding submissions in the lead-up to next year’s Budget,” Mr Lucas said. If you use Firefox, download the addon/extension called Anti-Paywall. It's logo is a blue monitor with a white arrow in the corner of it. Is this only for a PC/laptop? Is there anyway you can bypass on an iPhone or iPad? There’s also another story on adelaidenow about how ACC’s plans for a PGA-standard golf course could thwart plans for an arena. In typical adelaidenow style, it’s probably a beat-up story but would still be interesting to read about it nonetheless. Adelaide City Council’s plan for a PGA-standard golf course could be in conflict with an increasingly strong push for a multipurpose sports stadium at Memorial Drive. Councillors will on Tuesday vote on whether to make an extract of its North Adelaide ‘Golf Course Master Plan’ concept document public, in the wake of increased speculation around a new multi-use stadium at the southern end of the public course on parklands. Despite councillors and the Adelaide Park Lands Authority being briefed on the masterplan, it has been kept under confidentiality orders. However The Advertiser revealed key findings of the masterplan, including developments worth at least $20 million, in September. THE council finding new management of the course. The location where the masterplan suggests moving the clubhouse to, in order to capitalise on the Riverbank location and oval complex, is the same as the location being examined for a potential new stadium. Cr Phil Martin, who has put the proposal before council, said the public needed to know just what was at stake. “This is the opportunity for Adelaide to get a golf facility that is of international standard and can attract international tournaments to the city,” he said. “People should be able to look at what is being proposed. Cr Martin also said there were other locations in the city for a potential multipurpose stadium without having to build on parklands. “We are a city in the park, the only city in the park,” he said. “I don’t know if anyone would be proud of being a city surrounded by sports stadiums. “The parklands are there for people to enjoy and that does involve the playing of sport but playing sport and creating multistorey structures are completely different things. It comes as the state’s greatest tennis player joined the chorus of calls for a new or redeveloped multipurpose sports stadium at Memorial Drive, saying it would allow Adelaide to reclaim its place on the rich international tennis circuit. Former world No. 1 Lleyton Hewitt told the Sunday Mail that Adelaide needs a multipurpose stadium. “I love Memorial Drive but whether it’s a multipurpose retractable roof, whatever it may be, something basketball, netball, everything can play in, it would be great for the city,” Hewitt said. Other sites being mooted include an area immediately south of the River Torrens, stretching over the Adelaide Railyards. Being pushed by the Adelaide Venue Management Corporation, which operates the Entertainment Centre, Convention Centre and Hindmarsh Stadium. It would be an arena that could host soccer, rugby league, tennis, basketball and concerts. A business case has been prepared and land at the southern end of the North Adelaide Golf Course has been examined as a potential location. There is also talk of it being at the city railyards. 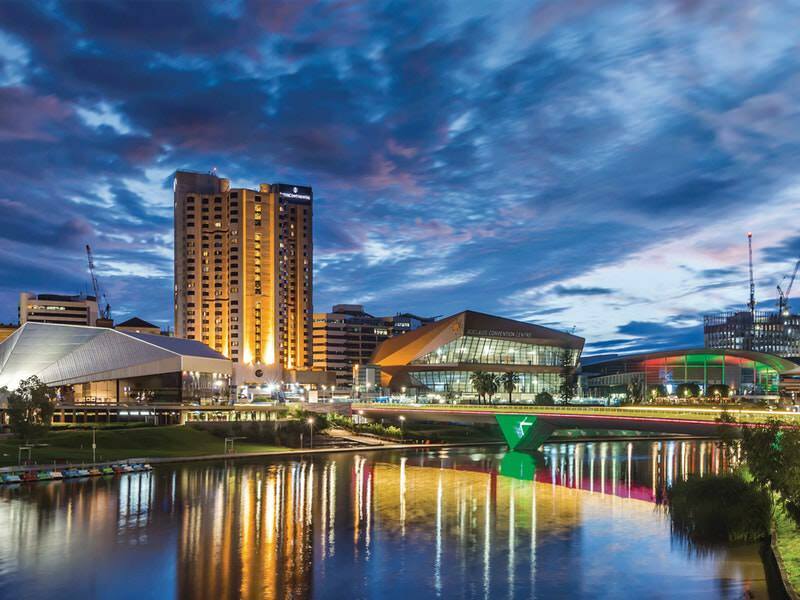 A masterplan prepared by consultants GHD Woodhead for Adelaide City Council is under a confidentiality order. But The Advertiser revealed in September it involves upgrading the course to international standard, and relocating the clubhouse from its current location near Strangways Tce to where War Memorial Drive and Montefiore Rd meet. A multimillion-dollar function centre would also be built as part of the new clubhouse. Why can’t they upgrade the golf course and memorial drive tennis? How do the two have anything to do with each other? Demolishing the existing tennis stadium and building a multipurpose roofed facility on the site wouldn’t have any impact on the nearby golf course which isn’t even connected to the site. Or better yet, why don’t they build a PGA standard course in the southern/south western parklands which are derelict..
Or would that be too close for comfort for those born with a silver spoon in their mouth?